An old German citizen family of the 15th century, a native from the province of Brandenburg. 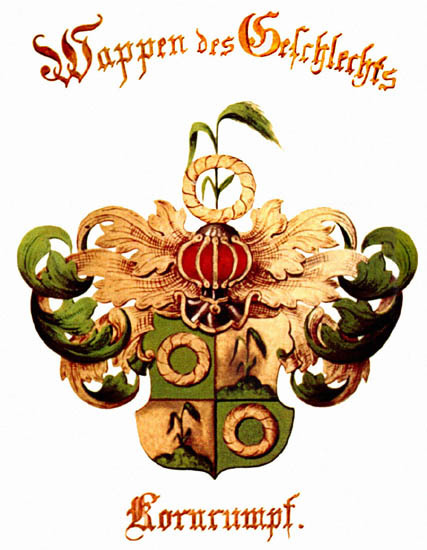 It is documented, that in the year 1652 the landowner and farmer Wilhelm Friedrich Kornrumpf was decorated with the family seal and the great Coat of Arms in parchment paper from the Prussian royal government for his best works for his fatherland. During the 30 years battles (Swedish Wars) W.F. Kornrumpf has given large parts of land all the hungry and needy people without money. For these works W.F. Kornrumpf was honored and decorated from the Prussian King-House. Descendants emigrated in the following generations to Netherlands and North America. A frontal pointed shield with a black shield-shadow. The shield is part and split up. In the right up and left below field in the color of green, a golden garland, in the left up and right below field in the color of gold, three hills in the color of green and ear in the color of green as symbolic of the fruitfulness, clean character, honor and constancy. A Gothic shield decoration in the colors of dark-red, green and gold, framing the helmet and the shield. A side-frontal helmet in the color of silver with red observation slits, a golden decoration, a black shoulderband and a red arm-decoration. A crown in the color of gold with red and blue decoration, over that a garland, with an ear in the color of green as symbolic of the constancy and the true services of the King-House. This simpler crest may be an earlier version. The general theme of a pointed shield, helmet, crown, silk bands and sheaf of wheat is the same as the more embellished version. Note that the family name is von Kornrumff. The colors of the crest are not known.